UC San Diego is one of the most environmentally responsible colleges in the U.S. and Canada, according to The Princeton Review. Released on April 17, during UC San Diego’s celebration of Earth Week and days prior to the April 22 celebration of the 42nd anniversary of Earth Day, the guide profiles colleges and universities that demonstrate a notable commitment to sustainability. The Princeton Review worked in partnership with the U.S. Green Building Council (USGBC), and evaluated how schools enhance sustainability through academic offerings, campus infrastructure activities and career preparation. They also selected schools based on a survey of administrators at hundreds of colleges that the company polled in 2011. The Princeton Review first created this guide for college-bound students in 2010 with USGBC, which is best known for developing the LEED standard for green building certification. “A green campus can transform the college experience for students through enhanced sustainability education and by creating healthy living and learning environments all while saving energy, water and money as part of an institution’s bottom line,” said Rick Fedrizzi, president, CEO and founding chair of USGBC. UC San Diego has gained a reputation for its sustainable efforts. The university was listed third in Sierra Magazine’s 2011 “Coolest Schools” report and received an A- grade in the Sustainable Endowment Institute’s “Sustainability Report Card.” In addition, UC San Diego was named the first college in California to earn a “gold” sustainability performance rating in the Sustainability Tracking Assessment and Rating System (STARS) survey. For more information on “The Princeton Review’s Guide to 322 Green Colleges,” go to www.princetonreview.com/green. 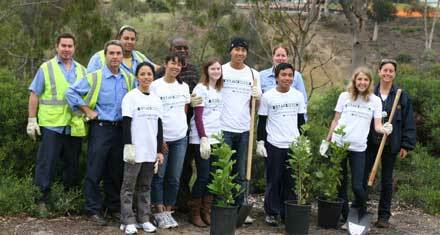 For more information on sustainability at UC San Diego, please visit http://sustainability.ucsd.edu/.